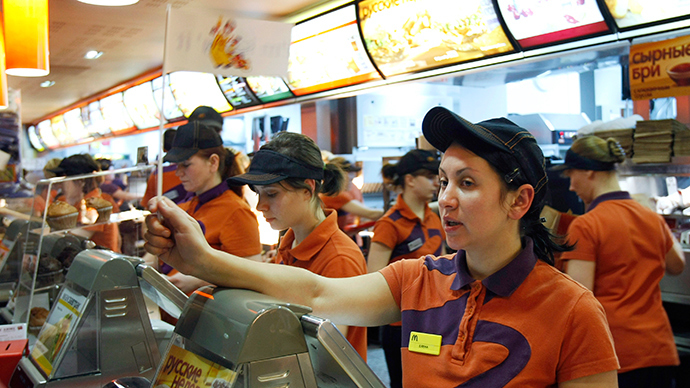 Russia’s consumer watchdog has shut down four McDonald's restaurants in central Moscow – including the first-ever outlet in the country – over “administrative violations.” More of the company 430 Russian franchises are under investigation. “Multiple violations of sanitary norms were detected in the sourcing of food and waste disposal in McDonald’s restaurants during inspections carried out between the 18th and 20th of August,” said an official statement from the watchdog, Rospotrebnadzor. “McDonald’s main priority is offering its customers quality and safe produce,” said a statement on the McDonald’s website. Among the temporarily shuttered establishments is the restaurant in Pushkinskaya Square – once the biggest in the world – that became iconic when it opened in 1990 in what was still the Soviet Union, creating mile-long queues of Russians ready to wait several hours to sample the taste of America. The first checks - and subsequent rumors that the entire burger chain may be shut down - took place in the northwestern city of Veliky Novgorod in May. A separate claim from Rospotrebnadzor said that the nutrition sheets provided by the company did not match the actual content of the burgers on sale. The burger chain – which is headquartered in Illinois, but sells its franchise licenses to Russian companies and individuals - employs over 35,000 staff, and retailed nearly $1.5 billion worth of food to customers in the country last year. The shot across the bow – after nearly 25 years of rapid expansion in Russia for the US company – comes amidst an escalation of sanctions between Moscow and the West. After Washington and Brussels imposed restrictions on financial lending and technological imports for Russian companies due to the conflict in eastern Ukraine earlier this month, Russia responded by embargoing agricultural produce from Europe and the US for one year.